102k hits a day!!! insane!!! AnonD-7829, 27 Jun 2011I wonder what kind of camera specs will the camera oriented Windows Phone have in comparison t... moreWell one of the downsides of not using in house software is that the component integration outside of the basic chassis and SoC spec is a bit more difficult, especially when looking at Nokia unique stuff like a decent camera, or high quality audio. I would bet they imaging will be better than Android or iPhone, but not as good as N8/N9. In my mind the N9 is all about quality, not just specs. it will be a huge flop..
Mark, 27 Jun 2011He guys look, the best Camera after N8, according to Damian Dinning himself: http://convers... moreI wonder what kind of camera specs will the camera oriented Windows Phone have in comparison to this. [deleted post]You are right, the iPhone has a beautiful 3,9 inch curved glass CBD Amoled display. Oh wait, it doesnt. It has deep integration of Facebook and Twitter, Youtube, Vimeo, Flickr, in the entire OS not just app silo's... Oh wait, it doesnt. It is made of sturdy unibody polycarbonate. No color loss, no breaking. Oh wait, iPhone is made of glass. You can make phone calls with it... Oh wait. N9 is what the iPhone should have been. There already are apps for the N9, they are Qt apps I already have on my C7. with just its looks and pinch previews, i think it really holds more shockers for the nokia fans out there like me… there are two things i really hope. first, i hope that this device holds more awesomeness, especially with the “speed”, which is the only one thing flawing the n8.. the last thing is that i hope nokia would continue working on for meego to its optimum performance and capability.. NOKIA, instead of walking on flames with microsoft for attention, why not just polish your classic shoes for attractions… pleasse. more POWER!!!! [deleted post]You are not getting this at all. It has a UI that frees you from the dumb "push a bottun to return to my app grid" paradigm. THIS is the next thing. 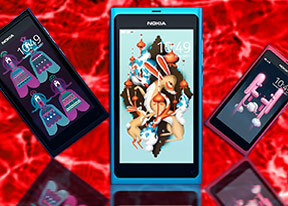 Even Engadget agrees, the N9 is what the iPhone should have been. fun9, 27 Jun 2011The highest daily interest i've ever seen in gsmarena. Nokia should reconsider that n9 will be... moreThe N8 hanged around at 94-96% daily interest too for a fairly long time, as well. The highest daily interest i've ever seen in gsmarena. Nokia should reconsider that n9 will be a hit n keep goin' on with meego. Hopefully n9 is not d last meego. i hope nokia ships dis beast wid an HDMI port ! No keyboard? :( Thats pretty much the only thing it misses. Does anyone know how much this phone will cost in the phillipines? or just any wild guess? thanks. The set seems to be bigger than N8, however I seem to like it, but I want to know the price before I could order one. Thank you. [deleted post]Why do you think that?